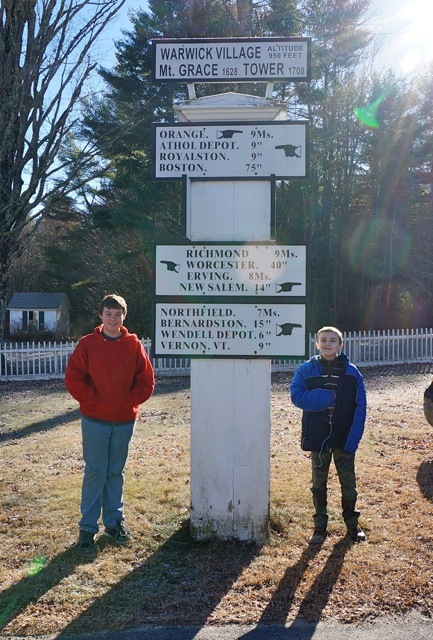 Welcome to the official home page of the historic town of Warwick, Massachusetts! I hope this page will help visitors locate information about our town and its history and attractions, as well as serve our townspeople as a source of helpful information and an electronic Town Hall. And see our wonderful town Newsletter (April 2019 issue) - recent, older newsletters are here; or join the WarwickList, or the Warwick L-ternative Facebook page for even more information about our town. Warwick's Community School stays open for another year! Thanks to all who participated in bringing this about! Here is the Notice and Order of Notice regarding the electric power supply aggregation which will replace the NGrid "Standard Offer". If you want to know what's going on in the town hall, read Town Coordinator David Young's biweekly reports! Photos of last year's Old Home Days Saturday events. Photos of last year's Old Home Days Sunday events. 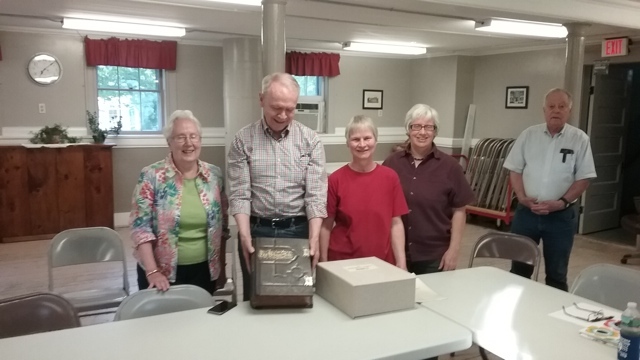 At the June meeting of the Historical Society, the Bergquist family presented their 1896 Bible to the Society. George and Alana Day and the Bergquist family did the honors. Mike Carey shares his photo of the event. The Athol Daily News has posted a wonderful video of George Day explaining the history and workings of the Town Clock. See it here. Amy Donovan of the Franklin County Solid Waste Management office posts this helpful guide to the disposal of batteries. MBI (Massachusetts Broadband Institute) has approved the Town of Warwick's application for $450,000 to complete the upgrade & expansion of our wireless internet system! Diana shares another photo. 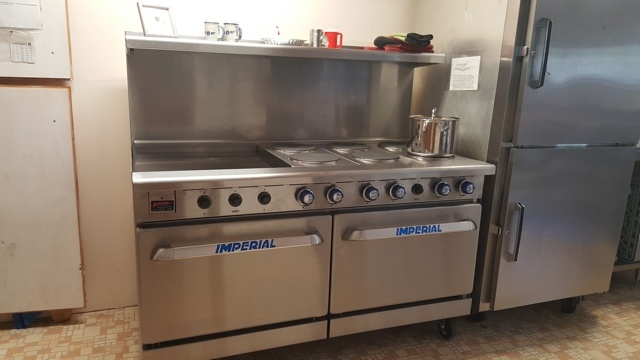 This time it's the new range in the town hall kitchen. 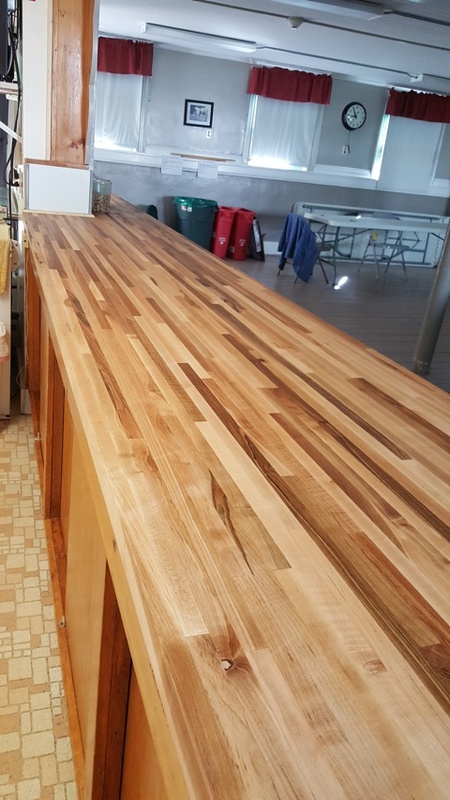 Diana shares her photo of the new countertop in the town hall kitchen. Ted Cady has posted the Planning Board's Report on Warwick's Population Trend and Impact. Amanda Mankowsky has provided us with this link to the North Quabbin Area Calendar of Events. Here is a link to North Quabbin Energy's Annual Local Food Guide. Transfer Station Fees including Bulky Waste can be found here. 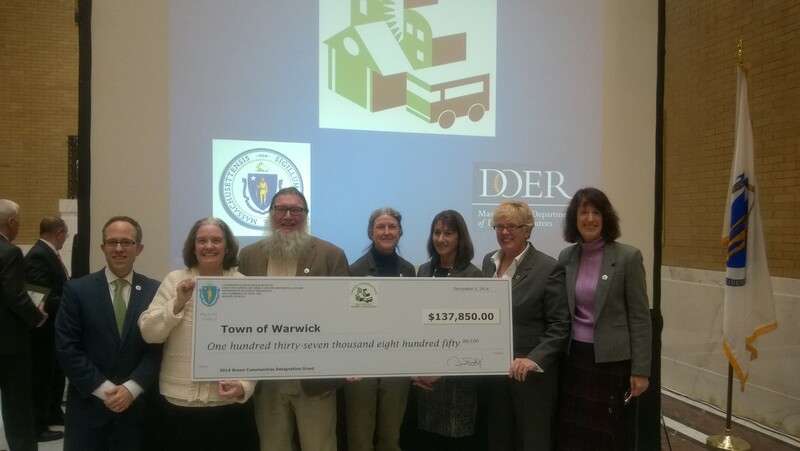 Warwick has been designated a "Green Community". Here's a picture (Photo by Hal Gilium) of the check Warwick received today at the Statehouse. It's a biggie! Warwick townsfolk can now get burning permits online at http://www.fcburnpermits.com/townlist.php. Or you can call Shelburne Dispatch at 413-625-8200. The Town of Warwick 2013 Multi-Hazard Mitigation Plan is now available for public comment. Note: this is a large pdf file (4 MB). Go here for an important notice from the Selectboard about loose dogs in Warwick. The Board of Assessors has posted a new link to Property Record Cards on-line and lots of other information, as well as Tax Exemption and Abatement forms. Not certain of what's recyclable and what's not? Unsure of what can or can't be re-used? Check out this handy site. It is now possible to download Warwick building permit application forms, both for one- or two-family dwellings and commercial buildings. Comments? Suggestions? Please contact the webmaster here.